New for 2019, the Core Shot A-Spec is a compact reflex sight from Sightmark. With an MSRP of $155, the Core Shot delivers IP55 water resistance, 8 brightness settings with 2-night vision modes, up to 1,400 hours of battery life and is able to withstand recoil of .50 caliber BMG rifles. Some dislike the Core Shot A-Spec’s 5 MOA red dot, which may completely cover targets at longer shooting distances. The Core Shot is available with a fixed mount or locking, quick-detach mount and comes with a lifetime warranty. 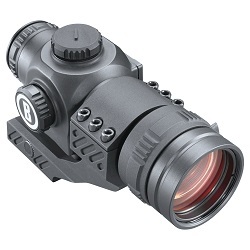 A traditional tube-style red dot, as opposed to a reflex sight, the Bushnell CQTS features a 3 MOA red dot and has 8 brightness settings. Its 32mm objective lens offers a wide field of view and is good for hunting and situational awareness in CQB scenarios. One of the downsides of the CQTS is its length; at 5.5 inches long, it takes up a lot of rail space and does not leave room for most magnifiers or flip-up iron sights. 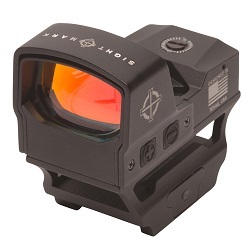 Retailing at just $39.97, the Axeon Dot Sight boasts red, green AND blue reticle options! The downside to these reticle options is that there are only three brightness settings per color, so there aren’t many adjustments you can make to compensate for different light levels. A 5 MOA dot keeps shooters on target, but like the Core Shot A-Spec, might be considered too large for some long shots. An impressive looking optic for the price, Firefield’s Impact XL reflex sight gives the option of 4 reticles with 5 brightness settings for each reticle. Shockproof and water-resistant, this sight is housed in durable cast aluminum and features a parallax-corrected lens system. The downside to the Impact XL is its battery life; though it does utilize a cheap and easy-to-find CR1632 battery, battery life is just 25-120 hours, meaning it’s not an optic you would ever want to leave on in your safe. As you can see, there are many factors and options to consider before purchasing a red dot. Make sure you do your research!